Look everyone! 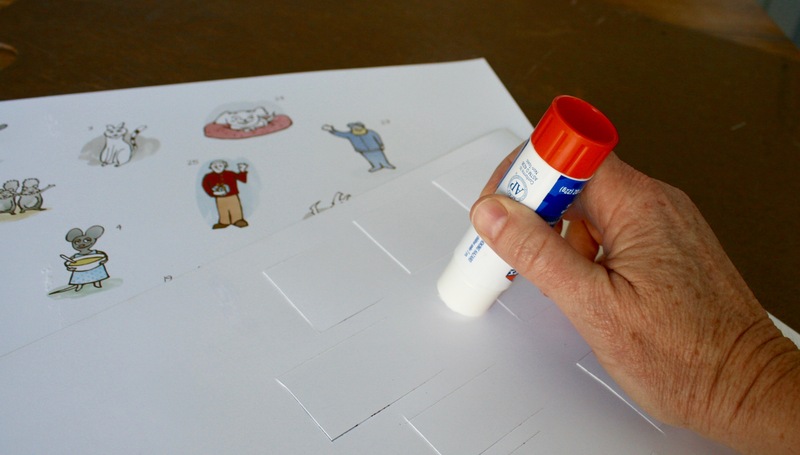 It's a PRINTABLE Advent Calendar! Our very first. We couldn't resist creating one to go with the Junkyard Tales Audio Advent Calendar. 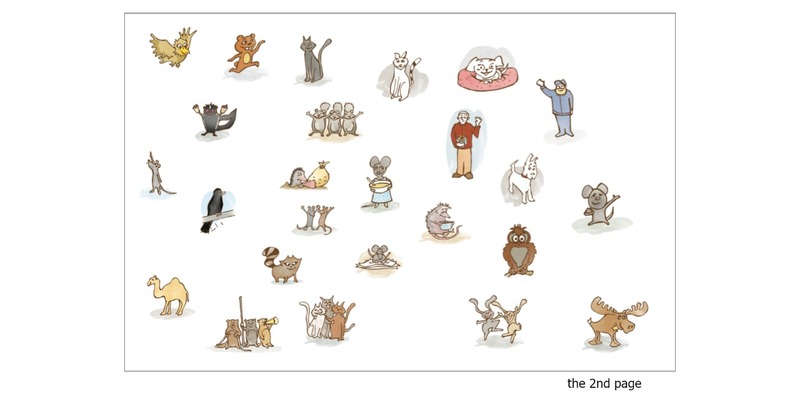 The stories are so fun and delightful, they begged for more engaging activities to go along. Each of the 25 little doors hides a clue to the matching story in the Junkyard Tales Audio Advent Calendar - so you can listen and open a door each day from December 1st to the 25th! This calendar involves a little DIY (cutting and glueing) - so we've created a tutorial video and post to show you what to do. Suggestion: I recommend doing this project without children so they can be surprised by the images behind the door. 2) Send it out to a printer. You'll want to print on 11x17 cardstock. We chose glossy because it looks so sharp. I used the UPS Store down the street - and simply placed the order on their website. But you can use any business that can print on 11x17 cardstock. You can email it to a printer, upload it to a website, or move it to a flash drive and take it to the print shop. Suggestion: Print 2-3 copies of each page so you have a fresh copy in case you make a mistake. 3) Cut the doors of the first page. Place the first page on a safe surface (that you're OK cutting on). 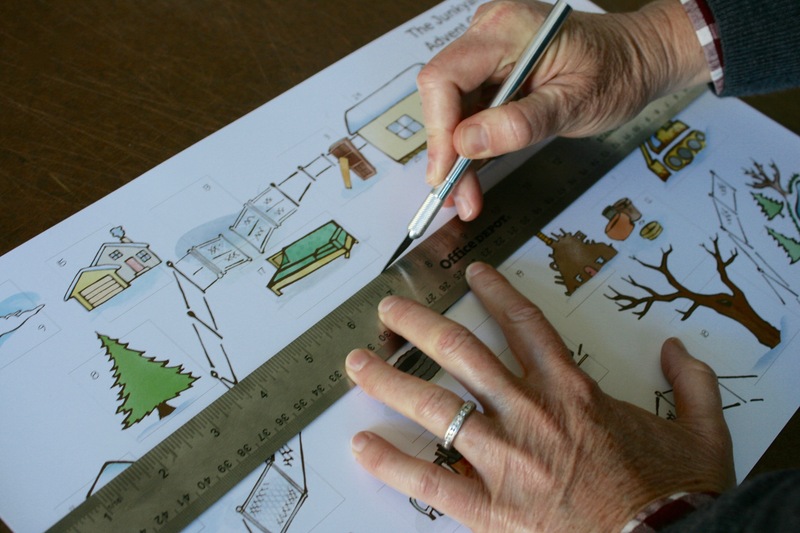 Using the metal-edged ruler as a guide, cut where you see the lines for the 3-sided door with the x-acto knife. Try not to open or bend them. Suggestion: Go slowly and take breaks. It requires focus and a steady hand. 4) Glue the back side of the first page. Turn the first page over (carefully so as to protect the newly cut doors) and add glue from the glue stick to the areas outside the doors. Important: Be sure to keep glue OFF the doors, otherwise the doors won't open! 5) Lay the 1st page on top of the 2nd page. Make sure the sides match perfectly, and then use your hands to smooth the entire top. And there you have it! 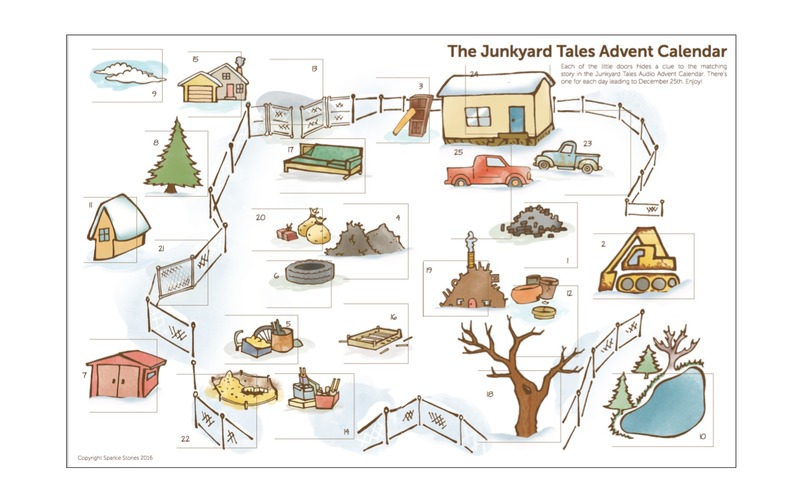 Your own Junkyard Tales Advent Calendar! Would you rather have an 8.5 x 11 version? Download it HERE.